When it comes to Theme Parks, age really doesn’t matter. Small kids… young adults… grown adults… We all love a day at the Theme Park, and thanks to operator’s charging around year’s wage for a family-day-pass, it’s become somewhat of a treat, with most of us only going every few years. 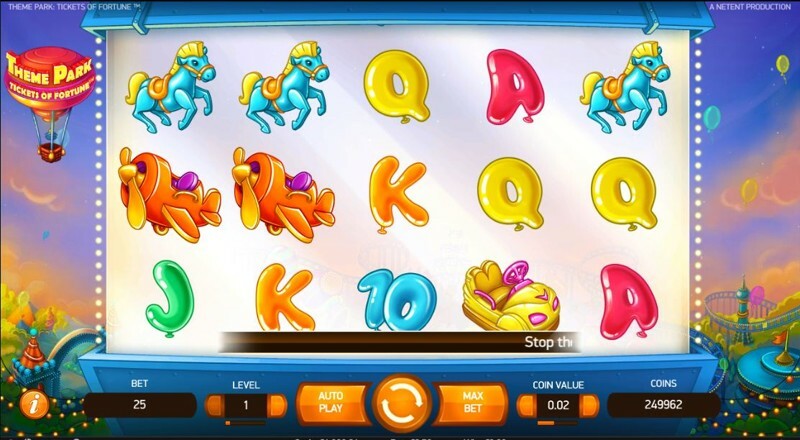 That’s the reason why we love Net Entertainment’s Theme Park: Tickets of Fortune – a Video Slot that features all the exciting and nail-biting aspects of a day at the Theme Park. This exciting game uses 5 reels, three rows, and 50 pay lines, and is set against a background of an aerial view of a Theme Park, with balloons rising high into the sky, past a hot air balloon. On the reels, you’ll see a mixture of symbols, with the high-paying symbols including a Spaceship, an Aeroplane, a Bumper Car, a Swan, and a Horse, and the low-paying symbols are Net Entertainment’s standard playing card symbols, which includes 10, J, Q, K, and the Ace. You’ll also notice a stacked wild symbol, which is a cool-looking set of roller-coaster seats. Each carriage takes up one space on the reel, and when the wilds are about to land on the reels, you’ll hear a unique “wooooshing” sound, replicating that of a Roller Coaster – a great touch from Net Entertainment. Remember those mechanical claws you played as a kid, that no matter how much money you put in, failed to ever actually pick up a toy and place it in the hand-hole? 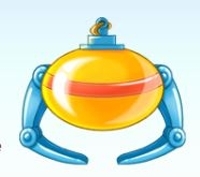 Well, Net Entertainment have finally turned the tables on this unfair, and depressing game, and on any spin, a giant claw symbol can land on reel five, which then claws off screen to collect a fluffy toy; the toy it grabs awards a random cash prize, with 15X being the highest prize amount. Punch Bag – Simply hit the punchbag, to win up to 25X your total stake. Can Tower – A classic, Theme Park: Tickets of Fortune’s Can Game requires you to try and knock down all 18 cans. Each can knocked down is worth 2X your stake. Sledge Hammer – Hit the sledgehammer on the screen mustering every ounce of your strength, to win up to 100X your stake. 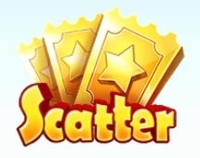 Skee Ball – You’ll be given 5 balls, which you must then shoot into multiplier holes: the total multiplier you accumulate is then multiplied with your stake to determine the win. Fishing – Pick five of the fish on your screen; each fish awards a random cash prize, with a maximum win of 50X per fish. Duck Shoot – Shoot five of the rubber ducks, and each duck will randomly award a cash prize, of between 1X and 50X, as well as extra picks.